String Theory Crochet: Beads and the Memories of Inherited Crocheting. I sometimes think there is some telepathic link between me and my daughter. I have just been photographing my latest crochet discovery which involves beads only to find that part of Vicky's post is about beading too. I am almost too embarrassed to put my efforts next to her glorious grey beaded dress - I have seen it in the flesh so to speak and it is truly beautiful. If I had put the amount of time and effort into making such an heirloom I would not let it out of my sight - the person who commissioned this piece is getting something amazing. Not only that but Vicky has made the same person that lovely cream skirt she is a very lucky lady in my opinion. Anyway I said almost too embarrassed, so here is what I have discovered and been practising this week: in the past I have made lots of pieces that involve beads but I have always either sewed them on afterwards or threaded them on the yarn before I started crocheting. Now I have realised that if you have fine enough yarn and a small hook you can crochet the beads in as you go along. The thickest yarn used here is gold coloured, stranded embroidery thread - perhaps a yellow background was a bad choice for golden thread? The pink and the grey/ silver threads are fine crochet cotton about gauge 10 I should think. The technique is to make a foundation chain and then where ever you want a bead you push the hook through the hole in the bead, pick up the yarn and pull a loop through the bead and then yarn over hook to complete the double crochet. In between the beads I have worked double crochets, somewhere between 2 and 5 between each bead. As you can see from the pink bracelet I havn't got it quite right yet - not all of the threads that make up the dc are on the same side of the bead. I am still excited by the fact that I can discover new techniques, new textures and some of the new yarns are incredible. In my last blog I was saying that after 50 years I was still finding out new things and Crochet Concupiscience made a really nice comment, but to be truthful I am 65 years old and was taught to crochet by my grandma when I was about 10 (or younger) so I reckon my maths tells me that it is more like 55 years that I have been crocheting - good grief! I may have been taught by my grandma but my mum was an amazing crafter who moved my skills on past just making trebles and chains. 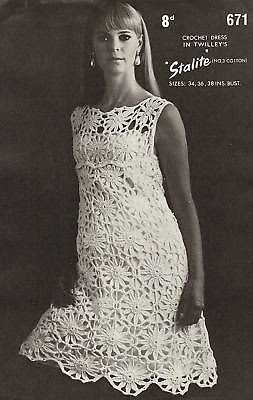 I was reminded of her crocheting skills when I came across this pattern for a flowery dress. Believe it or not my mum made this for me when I went off to university - it was made in deep pink with a pale pink lining. I loved it but it had two problems one was that at the time skirts were getting shorter and whenever I washed it it got longer so I removed a row of motifs about once a month. The second thing was that from a distance it looked as if I was wearing nothing underneath - I am absolutely certain that was not my mum's intention - but I didn't mind! p.s I have just remembered that it was obviously not just me that loved it because eventually it was stolen from the university drying rooms - I am still annoyed!